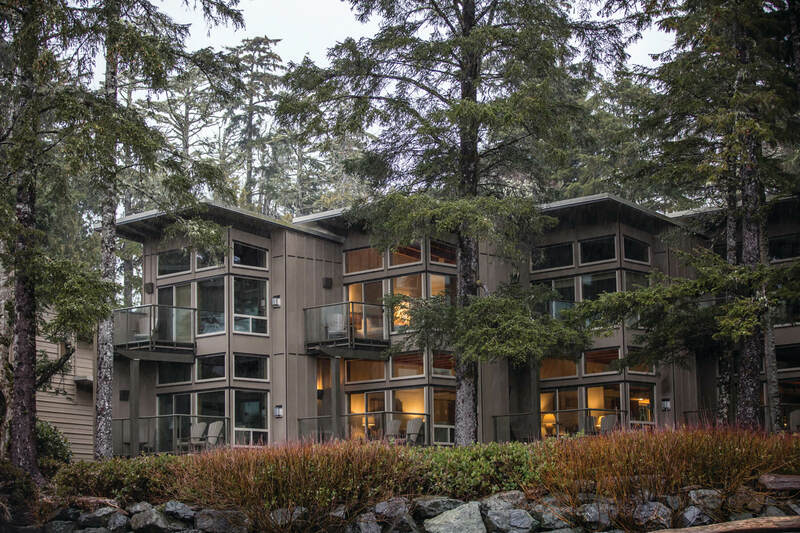 Located just seven kilometers from the village of Tofino, Pacific Sands Beach Resort offers a cozy front-row seat to nature’s most dramatic waterpark. 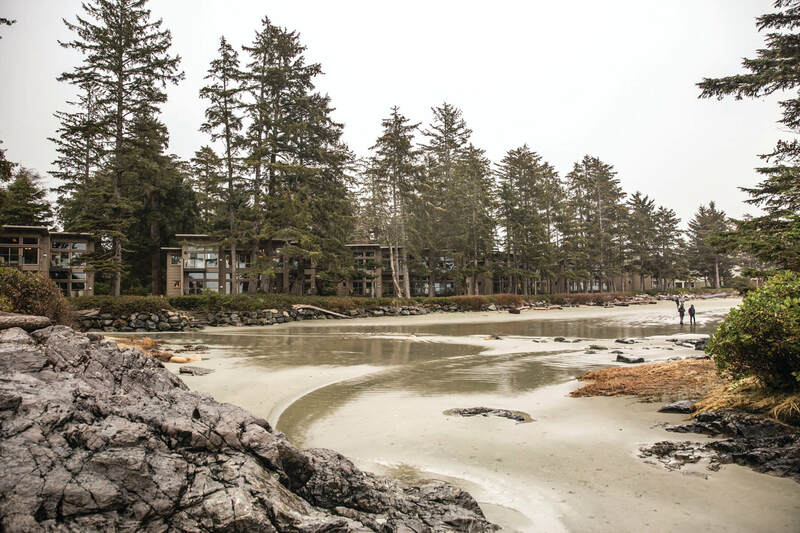 The resort’s 41-plus acres take in more than 1,000 feet of beach and 1,500 feet of undeveloped coastline on the crescent beachfront of Cox Bay. That’s not to say guests are roughing it. 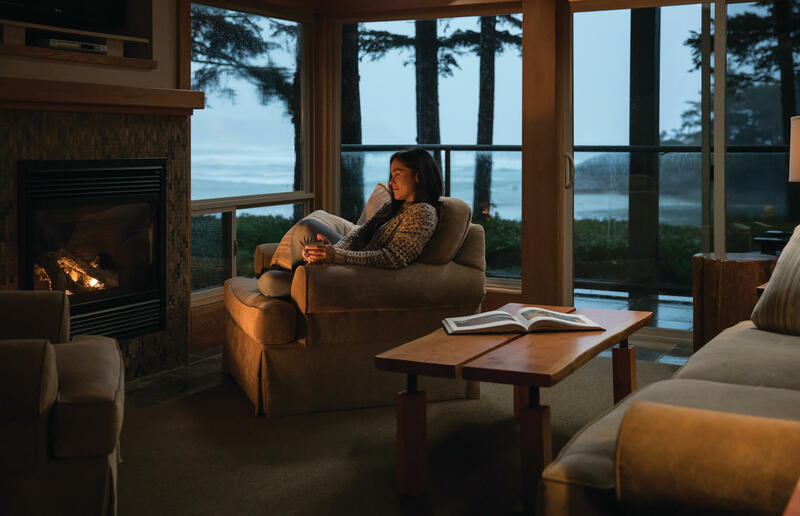 The only all-suite resort in Tofino, every room at Pacific Sands is oceanfront or offers an ocean view, and there is an abundance of comfy amenities, including fully equipped kitchens, gas fireplaces, organic coffees and flat-screen TVs. The selection of suites and beach houses provide a range of floor plans that appeal to both couples and families. All units are also equipped with private decks or patios facing the beach. Guests can choose from a variety of activities or just breathe in the intoxicating ocean air. Pick up some fresh seafood and prepare it in your own kitchen or venture out to a variety of restaurants for local ﬂavours. Renowned for year-round fun, it’s the perfect destination to explore ﬁshing, whale watching and golf, winter storm watching and all-season beachcombing. Built on family, romance and fun, guests have revered and returned to Paciﬁc Sands for decades. 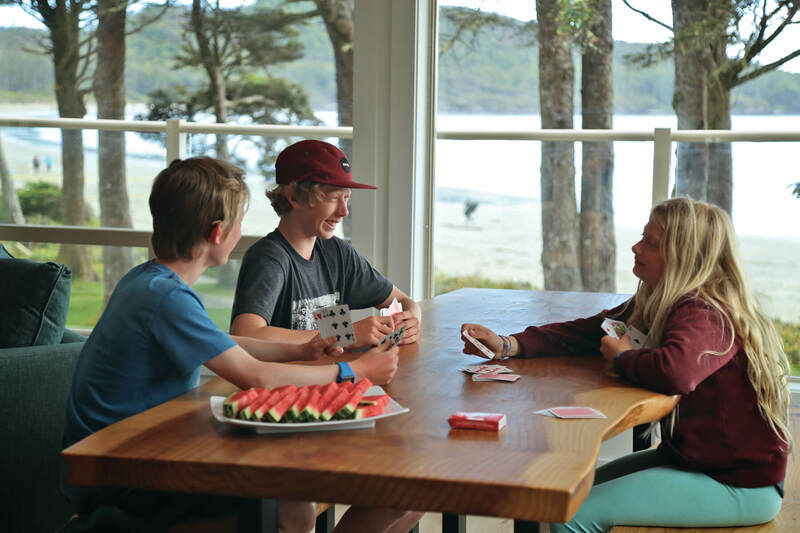 From s’mores and board games in the gazebo, to surﬁng adventures and boardwalk strolls, it’s a haven for making memories. 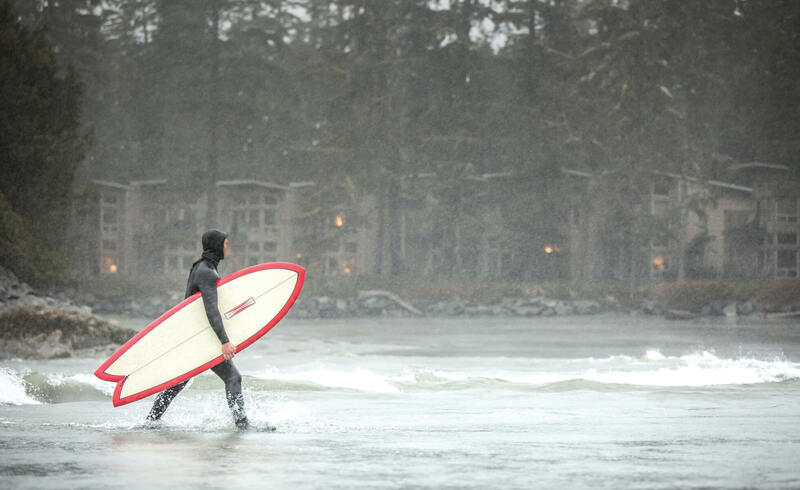 Paciﬁc Sands Tofino — the perfect convergence of land, sea and simple pleasures. 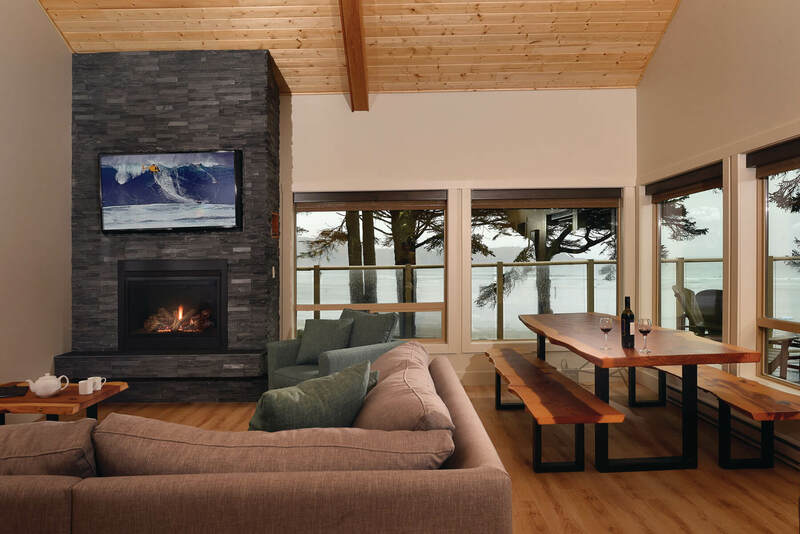 Pacific Sands Beach Resort is celebrating almost 45 years of welcoming guests to Tofino, and this year the resort added forty-three new suites. The expansion consists of one and three bedroom Oceanside Suites, perfect for romantic retreats and family getaways, and the signature two bedroom Edgewater Suite which boasts an impressive 700 square foot deck and private hot-tub, ideal for storm and surfer watching. Renovations to the Sand Dollar Suite, Beachfront and Light House Suites are also complete and include updates to bathrooms, kitchens, flooring, lighting, new premium furniture, stainless steel appliances and a fireplace to cozy up to during the cold months. There are new BBQs for grilling with friends and a hammock row for relaxing and taking in the endless shoreline. A newly refurbished reception area also brings a warm welcome to guests’ oceanfront oasis. Completed in spring 2018, the $10 million expansion brings the total beachfront accommodations to 120, along with the exclusive four bedroom Sunset House at Rosie Bay. Further upgrades will continue throughout 2018 and include work to the Lodge Buildings’ suites. Pre and post-surf snacks are served at the beachfront Surfside Grill, open seasonally from March to November. Welcoming guests to start the day with breakfast items including smoked salmon bagels and hot drinks from the Espresso bar, Surfside Grill is led by commercial fisherman Jeff Mikus and chef Jesse Blake. Much of the fresh seafood you’ll enjoy at Surfside Grill is caught by Jeff just hours before in coastal waters, while Jesse whips up daily specials from the boat to the kitchen, including charcuterie and seafood platters and fish and chips. Event catering is also available, from a taco bar menu for larger groups to a private seafood dinner for two. Pacific Sands offers daily kid’s camps in collaboration with the RainCoast Education Society throughout July and August. These programs help educate young guests on the ecology of the beach, ocean, tide pools, rainforest and wildlife. 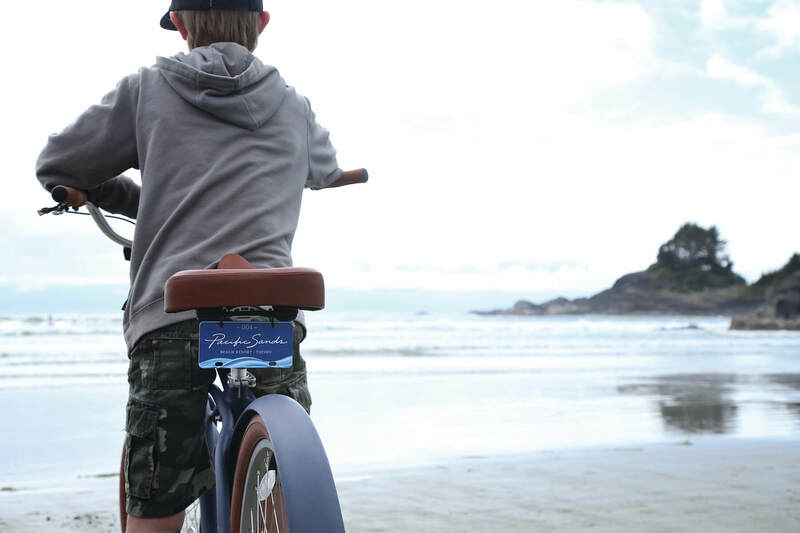 Other family activities include beach games, hosted fireside S’mores roasts, summer movie nights and complimentary bike rentals. 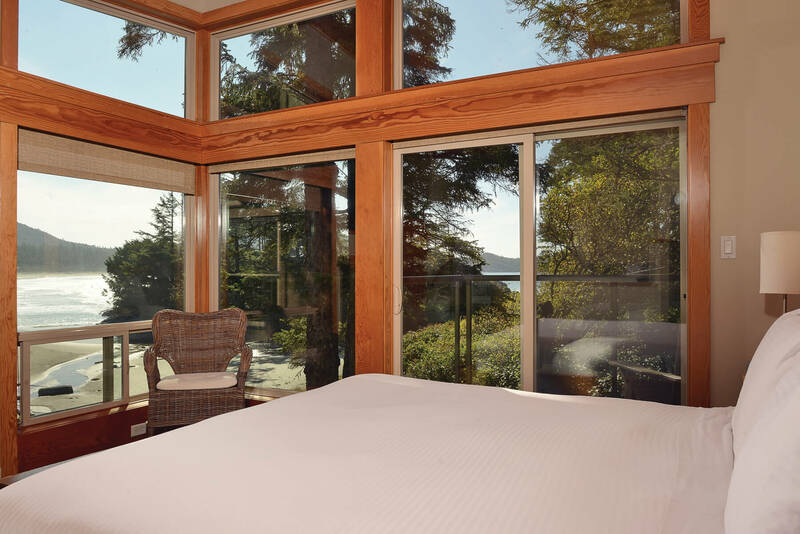 Get a taste of the Tofino life with a stay at Sunset House, the newly renovated four-bedroom vacation home in a secluded Rosie Bay location. Hidden in a surf spot favourite, the previous owners’ home offers unique touches and incredible sunset views. Complete with a six-person hot tub, barbecue and outdoor fire pit and deck, the space is fully-equipped with a gourmet kitchen, dining area, breakfast bar and a living room that is ideal for cozying up in front of the gas fireplace. 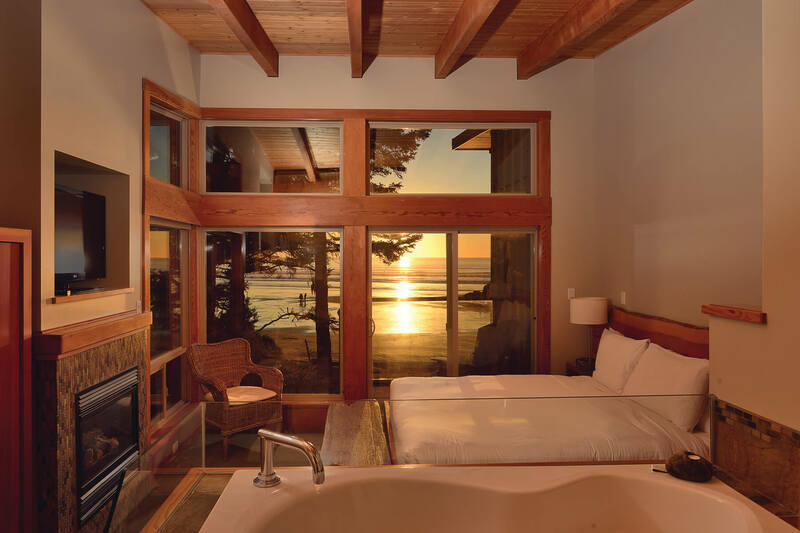 Two queen bedrooms feature, alongside the king bed master bedroom, which has ocean views and a full bathroom. The resort is a year-round surfers paradise with crashing waves, and a chilly 12C water temperature, that keeps surfers out on the waves whatever the weather. All suites at the resort offer ocean views and beachfront access, making it the perfect place to surf in and surf out each day. Cox Bay is home to some of the area’s best surfing and the neighbouring Surf Sister runs lessons for beginners and pros from the resort’s Surf Shack. Queen of the Peak and the West Coast SUP Symposium surfing contests (both in early October) bring renowned surfers and paddlers to Tofino’s coast each year. Get hitched, West Coast style. 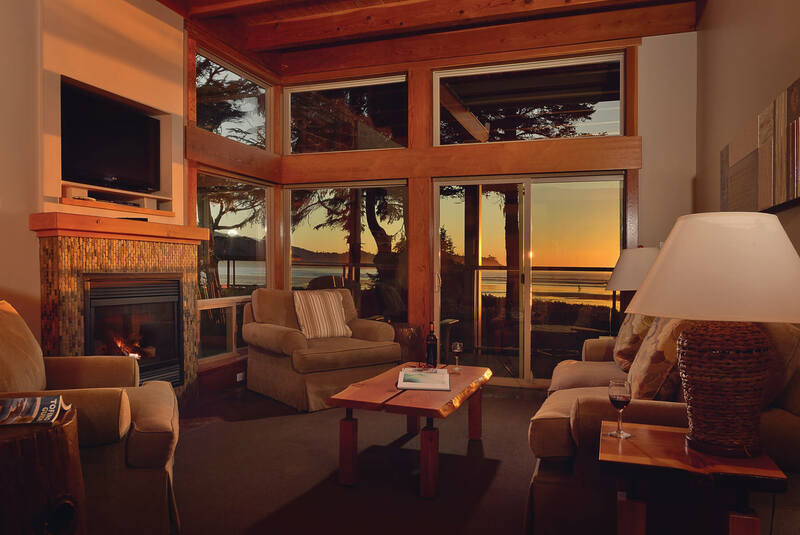 With suites and homes from 520 to 2,400 square feet, and all featuring full kitchens, cozy fireplaces and panoramic beach views, Pacific Sands Beach Resort is the perfect location to tie the knot. Embrace the elements for a beachside wedding with beautiful Cox Bay as a backdrop. The resort has partnerships with wedding planners and large offsite oceanfront locations are minutes away that can host large receptions, with the option of catering by local chefs. 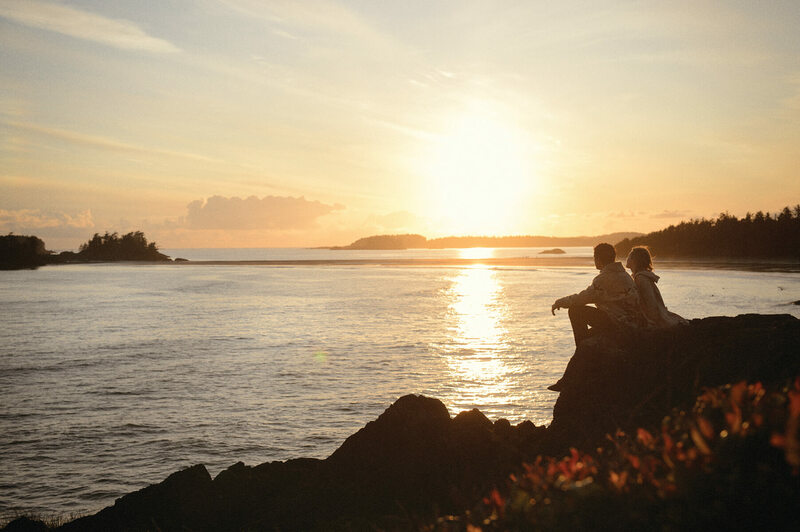 Tiny Tofino is hugely popular amongst foodies, with visitors travelling from far and wide to experience the West Coast’s fastest-growing culinary hotspot. Surfers searching for a tasty bite can stop by the infamous Tacofino food truck, which continues to serve the all the local favourites. For exquisitely prepared baked goods, visitors should head to the recently opened Summit Bakery. Shelter is the ‘go-to’ for fresh favourites, for killer margaritas and local fare try Sobo or visit Wolf in the Fog, serving up award-winning West Coast cuisine. The newest addition to Tofino’s flourishing culinary scene is 1909 Kitchen at the new Tofino Resort + Marina, which offers locally sourced dishes. Indulge in sweet treats made in-house at Chocolate Tofino and visit Tofino Brewing Co.’s new location for the best in local craft beer. 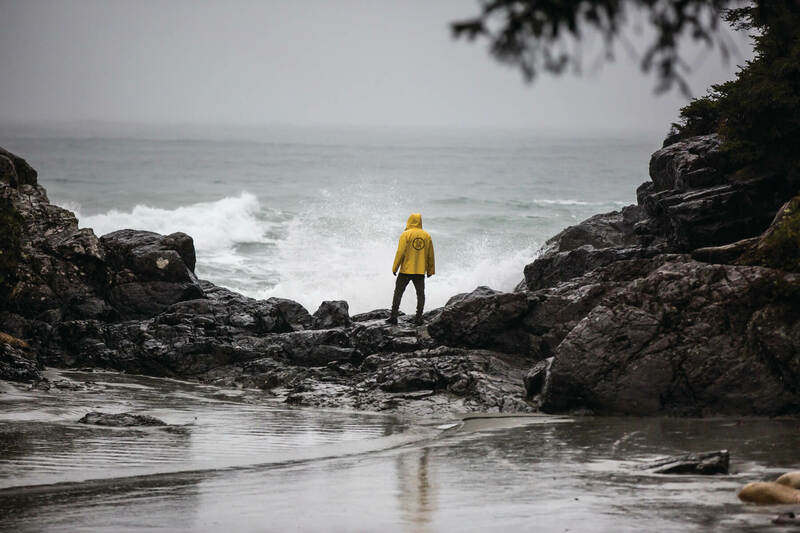 Artists flock to Tofino thanks to its unique scenery and nature’s amazing palette of colours. 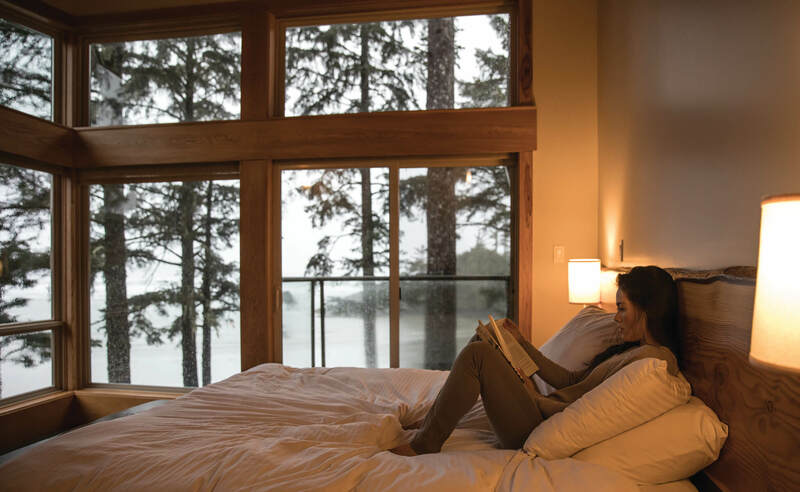 Pacific Sands Beach Resort’s rooms are adorned with a variety of local Vancouver Island art and furniture, supporting the community and showcasing the regional artisans. 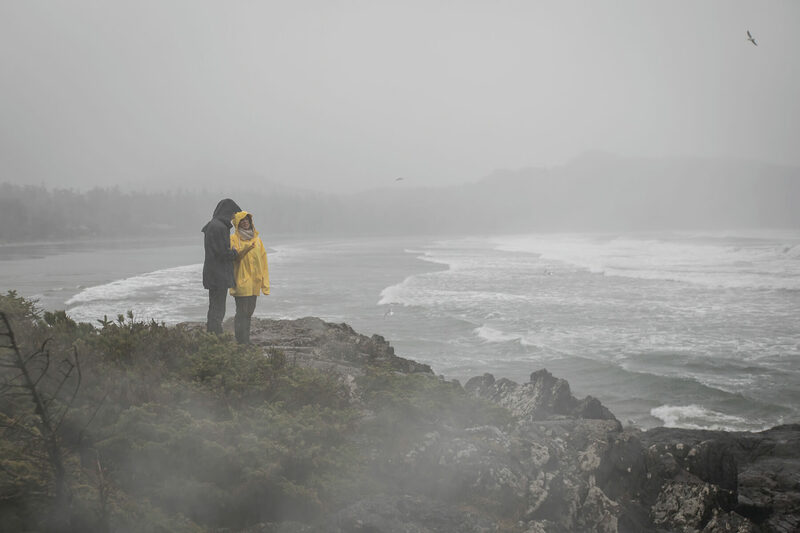 Much of the resort’s artwork is by Jeremy Koreski, a born and raised Tofino photographer. A coffee table created by the talented woodworker Paul Owen sits inside the Guest Services office, while the resort’s new Oceanside suites are decorated with prints by local photographer Owen Perry. The hotel offers a complimentary shuttle to the town centre, where artwork by acclaimed First Nations Artist, Roy Henry Vickers, is on show at his Eagle Aerie gallery. 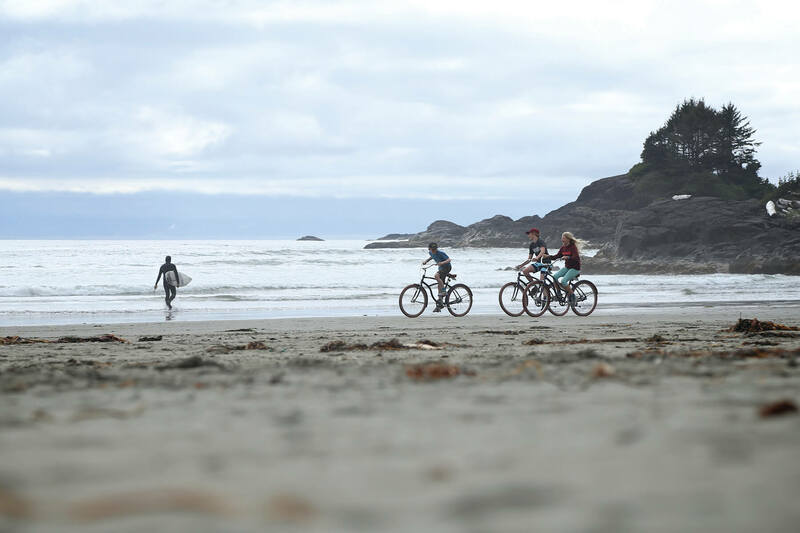 Small businesses thrive in Tofino, where the average age is 30-35 years old and the entrepreneurial spirit is strong in the tight-knit community, with businesses supporting one another to make the town better together. In Tofino, you’ll find places such as Tofino Brewing Co., started in 2011 by three young guys looking for an alternative to earning a living on the tug boats, Rhino Coffee House, founded by Duane Bell after leaving his stockbroker life to surf, Tofino Towel Co., which promotes the beach lifestyle across Canada, and Pacific Sands Beach Resort’s Owner and Resort Director Shane Richards, who spent time in California working in natural food sales before returning to BC to manage Ocean Village and then Pacific Sands in 2015. Collaboration is key for the young business owners of Tofino and Shane continues to support the on-site surf package partnership with Surf Sisters Surf School. Founded by Krissy Montgomery after a college vacation turned into a long-term stay in Tofino, she went on to establish her fun and educational surf school and the all-female Queen of the Peak annual surf contest. Bring along the furriest of family members for a vacation the whole family can enjoy. Four-legged friends will feel right at home at Pacific Sands Beach Resort as they are met with dog dishes, treats and pet towels upon arrival. With the beach serving as the resort’s backyard, canine companions are able to frolic freely along the shore, and when things get messy, the resort offers pet wash stations for an easy, post-beach rinse. Convenient, biodegradable dog bags and disposal containers are also available for guests’ convenience. Print and digital resolution images for your stories.